Another block done and i'm caught up on rr's! Woohoo!!! This one has more TAST (www.inaminuteago.com) variations. I saw this block as having a window in it with herbs and flowers drying on the beam above. I did a fly stitch lace on the ledge and the usual of the herringbone beaded variations. On the left side I did a seam with algerian eyes and detached/beaded chain stitches and above that, is a doubled herringbone with detatched chains, pearl knots and beads. 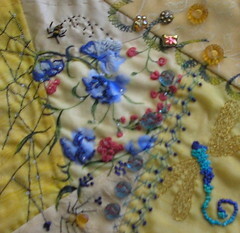 The yellow seam treatment is a small fly lace (one row) with detached chain rosettes and pearl knot below them. 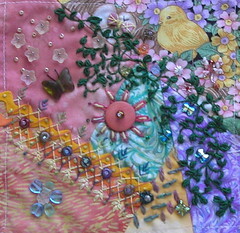 Then, the yellow patch contains a neat little glass pansy bead and some glass leaves with lilac beads scatter around them all over a seam of detached chain stitches. Enjoy! Hi all!!! i'm late getting this posted, but wanted to share with everyone! I have played with some of the different TAST variations (to date). www.inaminuteago.com ...and really enjoyed this block. 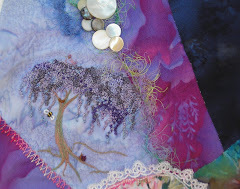 The maker had requested a tree from me....i'm hoping she is happy with it. I tried to stay withing the color schemes of the block and it felt like "fall" to me! I added the leaves on the tree doing a rather random herringbone stitch that I over lapped in different colors and added a few detached chains as well. I created a "rock" out of a neat bead I found in my stash. It looks neat in person anyway. :_) and placed a fly stitch bush around it. Above it are some fall mums blooming away! Off to the left are some glass bead leaves, and the leaf that was embedded in the pattern of the fabric, I stitched with some silk to pull it out and show off it's colors. 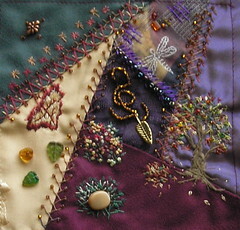 Above the leave is a beaded, herringbone, cretan seam treatment with algerian eyes that I varied just a small bit. 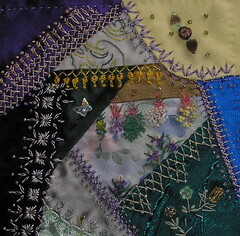 Last, but not least, is the herringbone seam treatment on the right with beads and detatched chain stitches. This is another block from a DYB round robin that has been completed..... more additions for the TAST (www.inaminuteago.com) project! I did herringbone for the dragonfly wings, a chevron/fly stitch variation and herringbone curly cues. The flowers on the cotton print are spruced up with some cast on petals and a bit of satin stitching to carry them over to the other block. I also added the metallic DMC thread web with a little spidey to bring luck to the block! I also added a brazilian embroidery bee! One of my favorites!! Enjoy! This is a pic of a block I just completed for a DYB round robin i'm in. There are versions of the detached chain stitch, a herringbone varition so those are my small contributions to the TAST project (www.inaminuteago.com) and lots of beady butterflies and a teensy beaded dragon fly! The vines are topped off with cast on leaves, which I like to play around with for shape and size. This was challenge for me due to the cotton fabric patterns....but hopefully the owner will enjoy it. Here I am with another marathon posting session! I haven't figured out how to keep up with blogging AND do everything else that needs to be done! :_) This is a special project I undertook for a friend. It is a small bag for her husband. He owns a Citroen and this is a stitched version of it. I added the border to keep it from rolling off the side of the bag! This was all done to her specifications and is stitched on ultrasuede. I added another layer of ultrasuede to the interior as I put it together to make it more substantial and hopefully absorb some of the wear with use.